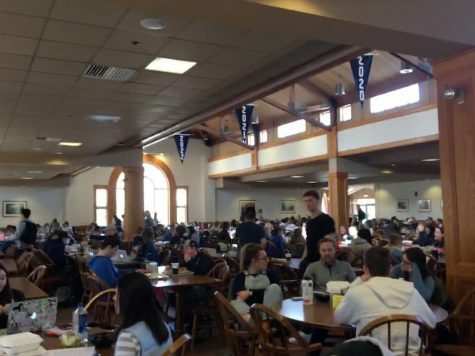 Lent at Saint Anselm College is a special time, characterized by no meat served in Davison or C-Shop on Fridays and students buckling down for the next few weeks of classes until the arrival of the long awaited Easter break. Yet, this 40 day period which mimics both the wandering in the wilderness by the Jewish people until their admittance into the Promised Land and the tempting of Christ in the desert, is a time which can garner great benefits if one is willing to make the most of all it offers. In Lent, Catholics often strive to take on or give up certain things which either will help them or are hurting them from establishing a relationship with Jesus Christ. The hope is that after these 40 days, as Christ willingly takes on the cross for our sins and is resurrected in order to give us new life, so too will our vices and bad habits be put to death and our truest, most virtuous selves be given new life. As a Catholic Institution, Saint Anselm College provides a great deal of opportunities for students to make the most of their Lenten journey. It is my prayer that during this Lent, we may make the most of the opportunities being given in order to more fully walk with Christ who sets us free by His death and resurrection. The Abbey: As always, the Monks offer daily Mass at 5:15 p.m. M-F and twice on Sundays in addition to Confession every day from 4-5 p.m. Immersing oneself within the Sacraments is a wonderful opportunity in order to prove a fruitful Lenten experience. Adoration will be offered following every Wednesday night Mass. Stations of the Cross: The Knights of Columbus will be praying the Stations of the Cross every Friday at 12:30 p.m. in the Abbey Church. This is a great way to walk in the footsteps of Christ and to learn more about what He experienced. Retreats: The Peer Ministers will be hosting a faith-based retreat on Wednesday, April 3 from 6-9 p.m. in the Lower Church. The theme is entitled: The Father Draws Near: Finding Christ in the Chaos. Campus Ministry is hosting an encounter St. Benedict retreat on March 21 from 5-8 p.m. in the Lower Church. This is a great opportunity to learn more about our Benedictine Heritage. Lenten Reflections: Campus Ministry sends out daily Lenten reflections written by faculty, monks, and students. Sign up by emailing Campus Ministry. Benedictine Heritage Week: From the week of March 18-22, there will be a number of programs held on campus to learn more about our Benedictine Heritage and to honor our monks. Soup and Spirit Lenten Lunches: Wednesdays throughout Lent at 12:30 p.m., members of our community will share stories about going “Into the Wilderness” in their lives while providing a simple soup lunch. Haustus: Held on Fridays March 22 and April 5 at 2:30 p.m. in the Pub, hear special guests talk about how they journeyed to find meaning in their lives while enjoying some great food and even greater company.